Holy moly!! 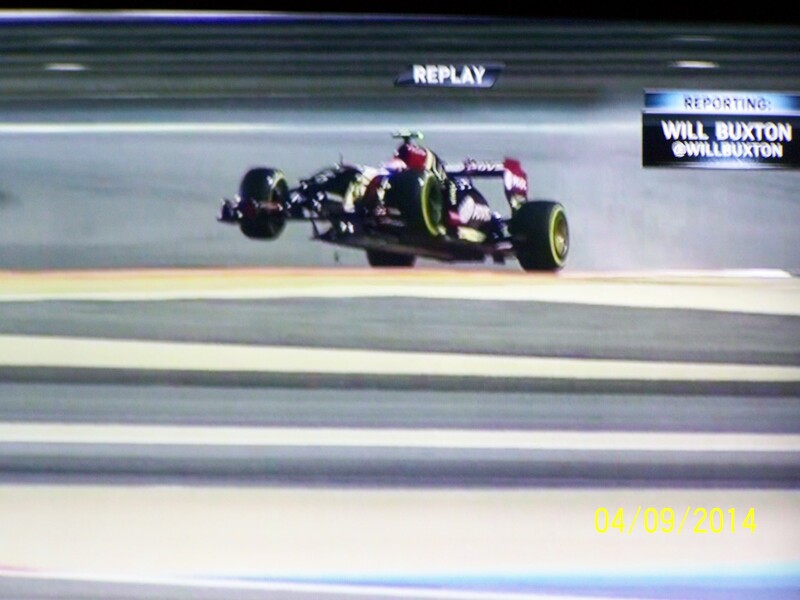 Bahrain was without a doubt the best race I have ever watched!! Absolutely superb driving out of the entire field!! So many close races back and forth within the race! And for Hamilton to hold off Rosberg after the safety car - even though he was on the harder tires - was an absolutely great display of driving skill!! I have to say it seems odd that one engine builder is so far ahead of the other engine builders. After a more balanced field among engine builders the last few years, it seems strange that Ferrari and Renault are so substantially behind Mercedes. And apparently, the fans aren't the only ones that think the V6 turbo buzz boxes sound like crap. lol Quite a stir behind the scenes from drivers and others within management. Best race of the season! The power the Mercs have is pretty spectacular relative to Ferrari and Renault as you mentioned, and, as a collective and after watching all three races . . . the engine package this year stinks and they sound horrible. However, if future races have this excitement, especially up front, I can appreciate the racing . . . without sound! I don't mind the sound. It's futuristic. I really like that even though Mercedes has it figured out, they're still allowing their drivers to battle each other. It got boring for Vettel to have the better car and win all the time. These two are way ahead, but there's no team orders. The race yesterday was full of excitement and passing. There was so much going on at the end I didn't realize how much I'd tensed up. Also, apparently tickets for the F1 race in Austin last year were nearing $400. Guess I won't be going this year. Holy cow that's insane! Yeah tickets for everything have gone el shtoopid. I really wanted to go but I'm not an F1 level baller for sure. 3 Day General Admission to F1 at COTA is $169 and from my previous attendance on numerous F1 dates at Indy I prefer to walk around different areas of the track as opposed to sitting in one spot . . . . unless one can get into a Suite with free beer, which I never did. LOL! Pretty strong rumors that Ford is associated with one of the new teams that got the greenlight to try for next year. Not the biggest Haas fan in the world but if he's going to put an American team with Ford (or Cosworth Ford) motor on the grid then he's alright by me. It'd be cool to see, but i just don't know if it'll happen. As seen a couple years back with USF1 team, it's hella hard to get a team together. I can't see Ford pouring in a lot of money, and it takes a fortune to even get competitive enough to qualify. That rumor is about a year old. I seem to recall reading that some manufacturers would be willing to jump into F1 if a common global engine template would be adopted by the FIA for F1 and LMS. I can't see FMC jumping back into developing a single series engine, unless Cossie has already developed said engine and FMC can fine tune development. I'd like to see the displacement open to 1.6 V6s and 2.0 I4s, but doubt that will happen. Last edited by Evil_Capri; 4/11/14 at 03:24 PM. One of NASCAR's top team owners will add a Formula One program to his burgeoning stable. Gene Haas, co-owner of the Stewart-Haas Racing organization that fields the cars of Tony Stewart, Danica Patrick, Kevin Harvick and Kurt Busch in the NASCAR Sprint Cup Series, has been granted a license by the FIA to start a Formula One team for the 2015 season. No team based in the United States has competed in F1 since Lola-Hart attempted a limited number of races in 1985-86. "Obviously, we're extremely pleased to have been granted a Formula One license by the FIA," Haas said in a statement released Friday. "It's an exciting time for me, Haas Automation and anyone who wanted to see an American team return to Formula One. Now, the really hard work begins. It's a challenge we embrace as we work to put cars on the grid. I want to thank the FIA for this opportunity and the diligence everyone put forth to see our license application come to fruition." Founded in 1983 and based in Oxnard, Calif., Haas Automation is the largest CNC machine tool builder in the western world. Stewart-Haas Racing won the NASCAR Sprint Cup Series championship in 2011. Haas is also founder of the Windshear rolling-road wind tunnel in Concord, N.C.
Stewart-Haas Racing competes out of Kannapolis, N.C., in a facility that's currently being expanded to better accommodate Busch's No. 41 program, which was added prior to this season. Haas has indicated in the past that the F1 operation may also be based out of the Kannapolis, N.C. facility. Lotus team spokesman: "Pastor is not going anywhere due to a high level of carbon distress caused by a Dukes of Hazzard moment." That's exactly what may be happening. Cossie has their turbo V6 design for F1, they just couldn't get a buyer to finance fielding the engine this season. If Ford wants to get in for 2015, the Haas team with Cosworth's engine is the sensible approach. They can brand it with EcoBoost fairly easily, it won't be a production-derived engine but it will be a Turbo V6. I totally didn't even see that! Just going for a little ride! That was a amazing race! Great to see Lewis with back to back wins. Nico has done a great job as well. Glad to see a new color on the podium this weekend. Really glad to see him on the steps.